Stall 6, which literally is a club in a former stable, set up a three day festival to thank its partygoers – and it’s all for free! If you’re more into Hip Hop, then Saturday and Sunday are the days for you: Mike Skinner and Flow Box with DJ B2K & DJ Schwed will rock the stage. 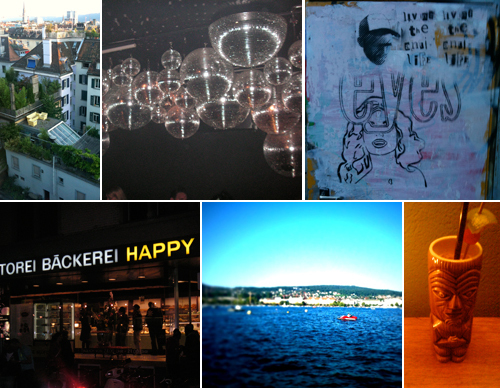 I only know about Zurich that it’s famous for its banks – that sounds boring to me. Why should I still come? No, no and no! Zurich is way more than UBS and Credit Suisse, don’t you worry! Once you have strolled around the lively quarter of Kreis 4, have had your first afternoon beer at Xenix and have danced at one of the many great clubs and concert places, you’ll know that. Oh, and don’t forget the lake. Who needs to go on a holiday when you can jump into the lake in the middle of the city. Coming to Zurich anytime soon?! Best coffee in town? Where to shop and where to dance? How to find the perfect place for a lazy afternoon? Tell us what you need to know and we’ll find the answer! Write your questions to moc.hciruzmorfdneirfymnull@olleh. Who needs travel literature when you have myfriendfromzurich?? My mom is worried about me travelling alone. Where in Zurich should I watch my step? Dear mom, don’t you worry. Your kid is very clever, otherwise he would not have heard about us. Seriously though, Zurich is a very safe city. But as in everywhere in the world, it’s always wise to watch your belongings and trust your gut.